Emplacement parfait, rez-de-chaussée Ancien patio privé. Peut-être que vous rêvez de la mer ou que vous recherchez de bonnes vacances avec votre âme soeur, vos amis ou votre famille. Nous offrons cette belle 2 chambres et 2 salles de bain complètes condo vue sur l'océan situé dans le bâtiment Topaz à Las Palomas Beach & Resort sur Sandy Beach, une station cinq étoiles, est à seulement 10 minutes du vieux port et du centre-ville. Il offre un parcours de golf de championnat de 18 trous par 72, des bassins de bord négatif (certains chauffés en saison hivernale) avec une piscine pour enfants séparée, un toboggan, une rivière paresseuse et deux bars aquatiques. Les rez-de-chaussée sont les meilleurs condos pour vos vacances, optimisez le temps passé sur la plage et les piscines et évitez de perdre votre temps à attendre les ascenseurs! NOUS N'ACCEPTONS PAS LES RÉSERVATIONS FAITES PAR LES PERSONNES DE MOINS DE 25 ANS SAUF ACCOMPAGNÉ DE QUELQU'UN À PARTIR DE 25 ANS AU COURS DE LEUR SÉJOUR. We thoroughly enjoyed our stay! This condo is in a great location on the ground floor. It has easy access to the pool and beach. From the well supplied kitchen to the comfy beds, the condo had everything we needed. We were also very impressed with housekeeping and the grounds crew and how they kept the entire resort so clean. We appreciate your positive feedback and happy to know that you enjoyed your stay. We look forward to serve you on your future vacation needs. We would like to remind you that we have a great choice of condos including 9 ground floor. I did share your comments about the housekeeping and the grounds crew with Customer service so they congratulate their crews. Thank you! Loved the resort and all it had to offer. Loved the location of our unit to pool and beach. Only suggestion for future vacationers is buy groceries in Phoenix. To complete your suggestion for future vacationers to buy groceries from Phoenix, I would suggest to verify what food can be taken into Mexico. That information can be easily found on the web. Thank you! Great condo, owners were very easy to get in touch with. Very clean and comfortable room with easy access to all the resorts amenities. Condo is located on ground floor with easy access to beach, pool and all other amenities. Large patio area to enjoy the evenings. Condo is modern and clean. Would definitely stay again. Bel emplacement, très grand patio ... au milieu de l'action! 3 nights minimum when a weekend is included We do not accept reservations made by people under 25 unless accompanied by someone over 25 during their stay. Monthly rates do not include daily cleaning. 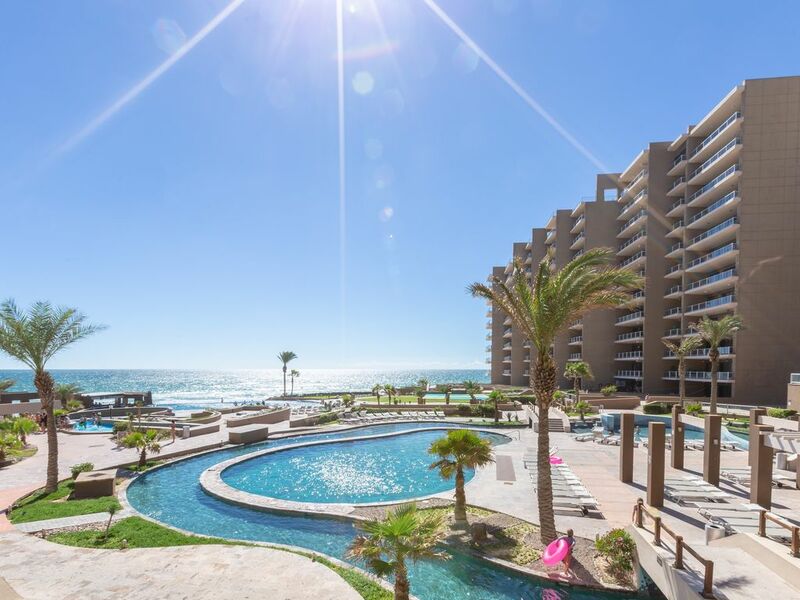 Reservations are made in the name of the payee and that person must be present for occupancy CHANGE & CANCELLATION POLICY: - Contact Owner by email and/or phone to request date or condo location changes. Rates are subject to change. - Confirmed reservations which are cancelled at least 30 calendar days before your check-in data will result in 50% cancellation fee. - There will be no reservation changes allowed within 30 days of your arrival day. - There are no refunds for early departures. - There are no refunds for holiday dates. - No reimbursement in case of eviction, zero tolerance policy. Please make sure you clearly understand our payment, change and refund policies. NON SMOKING POLICY Please be advised that all of our condominiums are non smoking units. If any signs of smoking are found inside unit, you will receive an on-the-spot infringement notice of $150dlls. CAPACITY Each condominium is for a specific number of guests (including adults and children). The number of guests is included in your confirmation. Only one additional person is allowed over the maximum capacity of the unit and will have a $35.00 USD charge per night, Children under 3 are counted as extra person with no charge. We do not accept reservations made by people under 25 unless accompanied by someone over 25 during their stay.